Moon Hunters is a 1-4 players myth-weaving adventure game developed by Kitfox Games with Unity. It was released on 10 Mar 2016, but beta versions existed since 10 Sep 2015 or before. The sigil was added while still in beta on 09 Feb 2016. The Sigil appears in some levels as a statue structure. In multiplayer, two or more people have to perform a specific pose (cheering) while standing on the sigil, which will make the piece appear on the screen. The solving of this piece was slightly delayed by waiting for the game to actually be released on March 10th, even though the sigil was spotted on March 8th. The piece is not stored in the game files, but is obtained from an URL on the game's website. 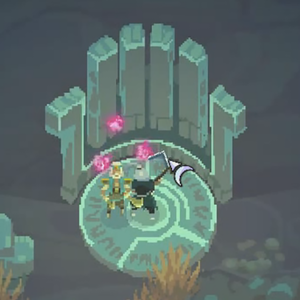 The sigil in Moon Hunters consists of a disc on the "ground" and a vertical "statue" piece. Their corresponding textures are called Mount_SigilDisk and Mount_SigilBack. This page was last edited on 1 March 2017, at 21:57.